The kitchen is the beating heart of your home and the most popular space in your house, transform it with a new design by Custom Interiors Kitchen & Bath. Enjoy your kitchen more and increase the value of your home at the same time. From start to finish, ceiling to floor Custom Interiors Kitchen & Bath can do it. Let us help create a lively comfortable place for you and your family to spend most of your time. When you’re planning for that new open floor plan kitchen there’s a lot to consider, kitchen workspace needs, traffic flow, electrical loads and structural changes just to mention a few. Our team of design and remodeling pros can make this design build process stress free and at the same time complete your project on time within budget. 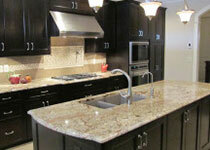 Quality materials, reasonable prices and knowledgeable staff make it easy to turn your dream kitchen into reality. Custom Interiors Kitchen & Bath, building long-term relationships and the kitchen of your dreams. 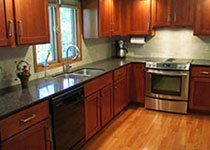 Refacing is one of today’s most popular ways to remodel your kitchen. Quick completion, minimal mess and affordable prices all make refacing an attractive alternative to a complete kitchen renovation. All of our doors and drawer fronts are constructed to the highest of industry standards from a select grade of fine hardwoods. 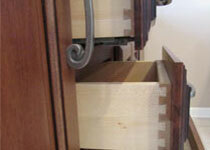 Our complete refacing process will include the replacement of all cabinet doors, drawer fronts & moldings. All exterior cabinet face frames, side & bottom panels will be fitted with matching pre finished wood panels. All Door hinges, handles and knobs will also replaced with new. If needed, the replacement of drawer boxes, countertops, sinks, backsplash wall tile and even adding a few new cabinets is always an option. At Custom Interiors Kitchen & Bath our emphasizes is always on quality and perfection, making your refaced kitchen one you will enjoy for many years. 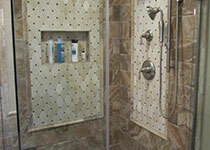 Bathrooms are the number one place that homeowners love to renovate. So if you’re adding or remodeling a bathroom remember, it might be a small room but there’s a lot to consider. Between wall protection and beautification, flooring, fixtures, ventilation and lighting, our staff at Custom Interiors Kitchen & Bath can make this design build process stress free. Our expert workmanship, quality materials and reasonable prices make it easy to turn your dream for a fabulous bathroom into reality. At Custom Interiors Kitchen & Bath we build long-term relationships and the bathroom of your dreams. "Thanks so much for all your hard work and attention to detail. We are thrilled with our new kitchen. Your cabinets are amazing! We love every inch of our new room."